One of the hardest things when visiting foreign countries is finding a cab driver who can communicate and is willing to drive you around for half a day or so. After many failed interviews yesterday, Ben, Andy, and I found the right guy. Don't get me wrong, we met many nice people. But three photographers are not your usual cab fare. So we drove off into the hills of Santo Thomas in Guatemala, and an hour later found ourselves in the Rio Dulce area. 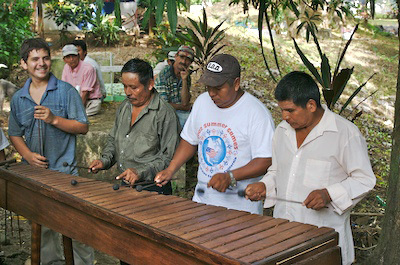 In a nearby park, we stumbled upon a family gathering... complete with a great sounding Marimba. At times, there were as many as four musicians all playing their part in the lively musical arrangement. The entire day was enjoyable, and it's left me with a very upbeat feeling about Guatemala. I wish you could hear the music in this photo.